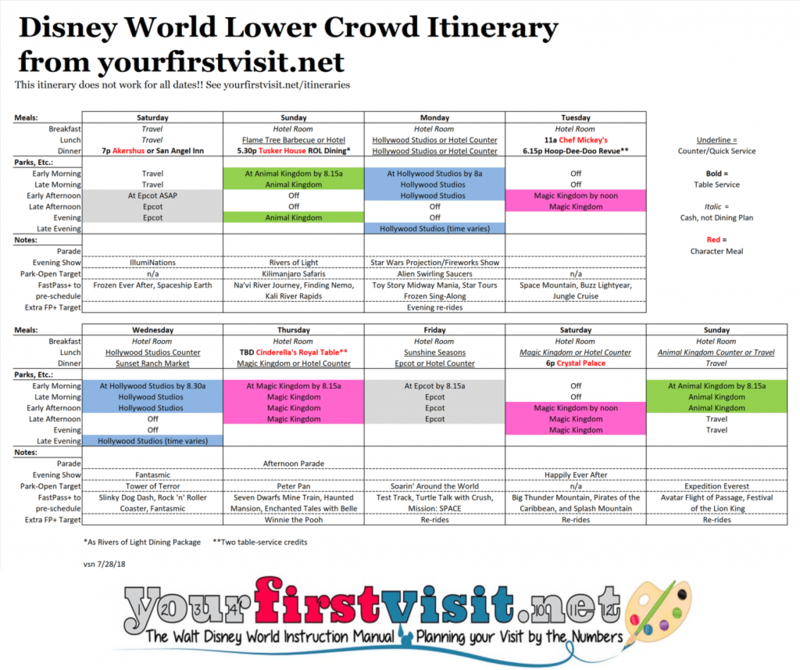 Below is my FastPass+ based Disney World itinerary for lower crowd weeks. For visits when your Studios days are between June 30 and and August 25, use the updated FastPass+ instructions and touring plans for the two Studios days you will find on this page. It is designed for lower-crowd weeks and does not work all dates after than. Check your week here. As always on this site, click the image to enlarge it. Hi Kelly–the 4 year old will be there just the 8th? You have plenty of time. For 4 and 5 years olds, you can plan 3 half days at Magic Kingdom, and a half day at each of the other three parks. You can then come back to favorites if you have more ticket days. See this for important info about FastPass+ and what you need to do to plan ahead. The itineraries on this site are meant for kids 8 and older. There are one and two day itineraries in Chapter 6 of my book aimed at younger kids that will work for most of the parks–they are called in it “character centric” touring plans. You can split them into more days so you aren’t in the parks so long. Plan if you can days off, and try to not be in the parks more than 6 hours a day. Love the itineraries on this site. We are going in August and was wondering if the itineraries will be updated before then. I see they were updated last in July 2018. Doing 3 Days in MK and 2 days each in AK HS and EP. Hey Kevin, I change the itineraires when there’s a material change in the park offerings or something else that shapes daily crowds–like EMH days. HS is picking up a couple of major rides in late summer–one has been announced for 8/29, the other, Mickey and Minnie’s Runaway Railway, has not yet been announced, but Disney would be silly to open the Star Wars ride without adding it. So I will be revising the HS days, but–so far as I can see right now–I wont’t be changing the days of the week for HS, so dining (which is what I worry about) won’t be affected.